Brenta Spire is the highest summit North East of the main Spires. It has amazing views down to Cobalt Lake to the East of a massive drop off of almost 750m down to the Vowel Glacier to the West. The rock is a matrix of Quartzite and Granite making it unique and it sees considerably less traffic due to its location. South Ridge: 4th Class. A long and aesthetic ridgeline which starts off as walking and steepens to 3rd and eventually steep and exposed 4th below the summit. Classic Mountaineering. South-East Spur: 5.6. Starting lower in the Cobalt Lake Basin, the SE Spur has over 300m of 4th class climbing with a few short sections of 5.6. Recommended. 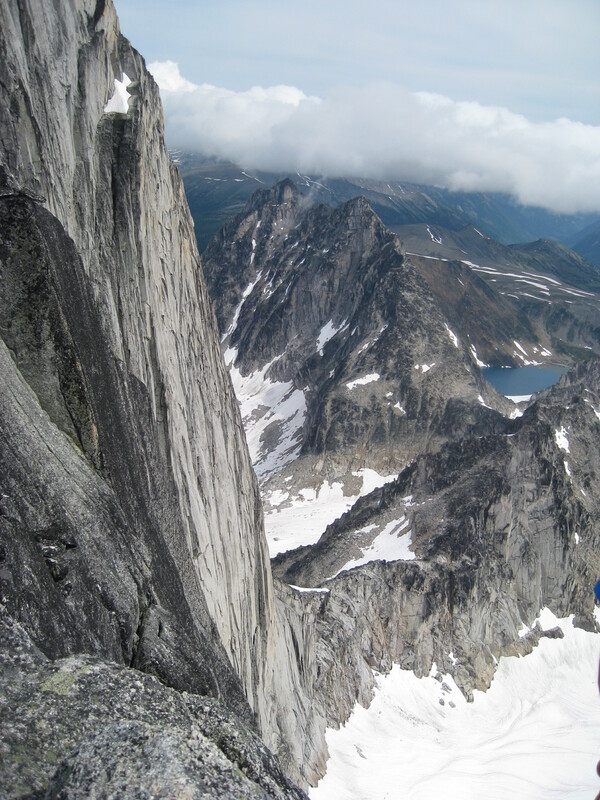 Looking down the East Face of Bugaboo Spire with the South Ridge of Brenta Spire and Cobalt Lake in the background.